Dry rot or suspension issue? How do the inside edges look? On my W211, the tires began "chunking" and "peeling" on both inside and outside. Turned out to be combination of bad bushings/ball joints. So, are you saying the tires are original to the car? 2010? If they are I would toss them in the trash. I would not ride on tires that are 8+ years old. There is a DOT date code on the side of each tire. Looks like tire spin over sharp object. I would check it all the way around, but if that is all - don't worry about it. Thank you for clearing that up. I would speak with someone at Continental Tire and send them photos. It may have been a bad batch of rubber at the outside of the moulds if they are all affected and produced together. I'll get the oil changed at the dealer in couple weeks. I'll ask them to take a close look to the suspension. Then, call the tire manufacturer if there is no wear in suspension. I don’t know if you purchased the tires from the dealer, but if you did I would also get them involved. Even if not, it doesn’t hurt to ask their opinion as they see thousands of wear patterns and premature damage on Continentals. I would stop by a couple of reputable tire shops in your area for their opinion on tire life left. I have seen that before on my cars at about the 4 year mark and it normally results in increased road noise. Hasn't been a safety issue for me so far. The last picture shows badly aged tire. What is the number behind DOT on sidewall? Happens on the Continental tires. They are just cracking from age. Look at your initial pics, the sidewall is cracking too. There's probably a small alignment issue and it combines with the tire compound to pull them apart. Ball joints and bushings. Control arms and thrust arms. Lower support ball joint. Upper ball joint. End. FWIW, I've run multiple sets of Continental tires. The only time this occurred was with bad ball joints and bushings. This doesn't "just happen". It occurs due to excessive wear in the suspension components. Your tires are only three years old. At five years in the sun, I'd be concerned. This is not the case. It's the suspension. 9000 miles on my first set of Continentals with bad ball joints/ bushings; 36,000 miles on my second set of Continentals with rebuilt suspension. Your circus, your monkeys. Let us know what you do and what the results are. Best wishes to you! 16 week of 2015, makes the tire 3 years old. No excuse for age cracks. Contact the warranty. However the 1st picture shows mechanical abuse, so this might not be easy case. Do you mean road conditions, driving style or suspension issues by mechanical abuse? I am getting cuts like on picture 1 when I drive my pickup on gravel road and spin the wheels pulling a trailer. 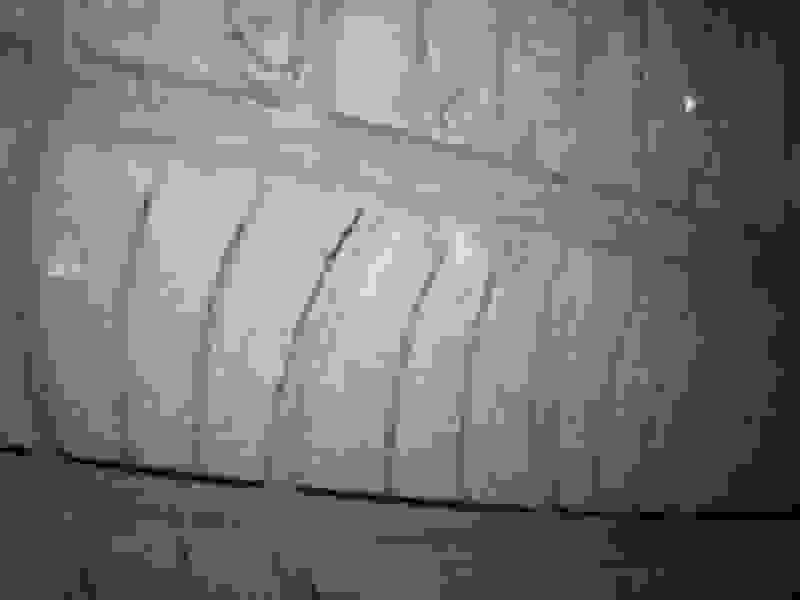 On that picture even sidewalls have cuts. A few questions. How many miles on the car and has any front end or suspension work been done on it. Have you checked all the tires for any other type of wear like feathering? 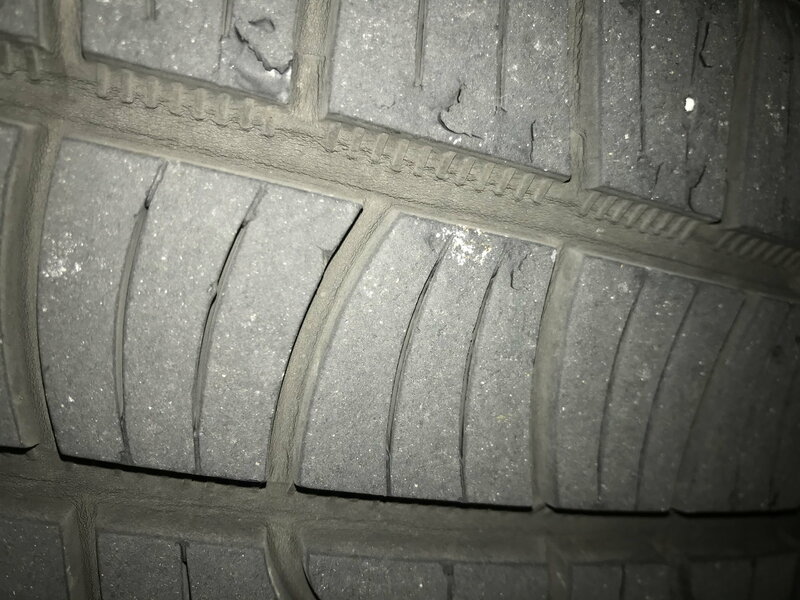 Is the damage all around each tire or just in spots? Do you drive on gravel or unpaved roads at all? What type of conti are these, hard to see in the picture. I'm running contiprocontacts on mine, have about the same mileage and were put on about 3 years ago and are wearing just fine. If these are the contiprocontacts then I had the same issue on my 2013 with only 28k mile on them. It was much worse the your first picture though, and only happened on the outside edge of both front tires. Rear tires were ok. All 4 were down to about 4/32" after 28k miles so I had them replaced. Tire shop, Dealer, and independent MB shop all said nothing wrong with the vehicle. They checked suspension, alignment etc, all was ok.
Changed over to Michelin Pilot Sport AS3+ and so far after 3k miles no sign of similar issues. 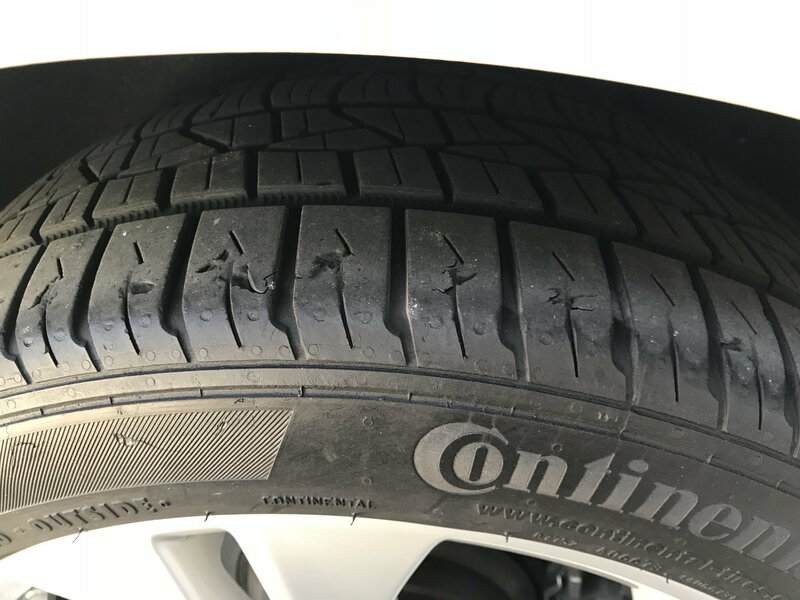 Previous car (non-mb) with the same model Continental tires also had same issues. Replaced them with Kumho tires and after 30k miles, did not have the chunking the continentals had. no suspension work has been done. The ContiProContact was the OEM tire, not this low end Pure Contact tire. The Pure Contact is $350/set cheaper. I have never seen anything like this on the ContiPro and I have driven on probably 8-10 sets over 3 E class cars in the last 15 years. Why do you think the pure contact is inferior? It has superior ratings than pure contact based on driver reviews. Price difference is $120/4 tire, not $350. My bad. I didn’t see you were on a 17” tire and was comparing it to my 18”. I hope you get this figured out. The photos just make the tire look like it has been sitting in the sun 24/7 and 125 degree heat. It looks completely shot. no worries, thanks for the input. I'll get the dealer check everything out and provide me a paper showing the suspension is in good shape (it was in perfect condition 1 year ago) and then i will call continental. I’m really curious as to how this turns out for you and what is going on. Please come back and let us know how you resolved it. Good luck! Quick Reply: Dry rot or suspension issue?